You’re shipping goods across the country. Lots and lots of goods to ship. But oh dear! Who organized this train, anyway? Everything’s out of order, and having the caboose first in line just will not do. Maybe if you can convince the workers to move the cars where they should or, barring that, just find new freight, you’ll be able to make it to your destination on time. On time is what it’s all about. It’s why you play this Game of Trains in the first place. 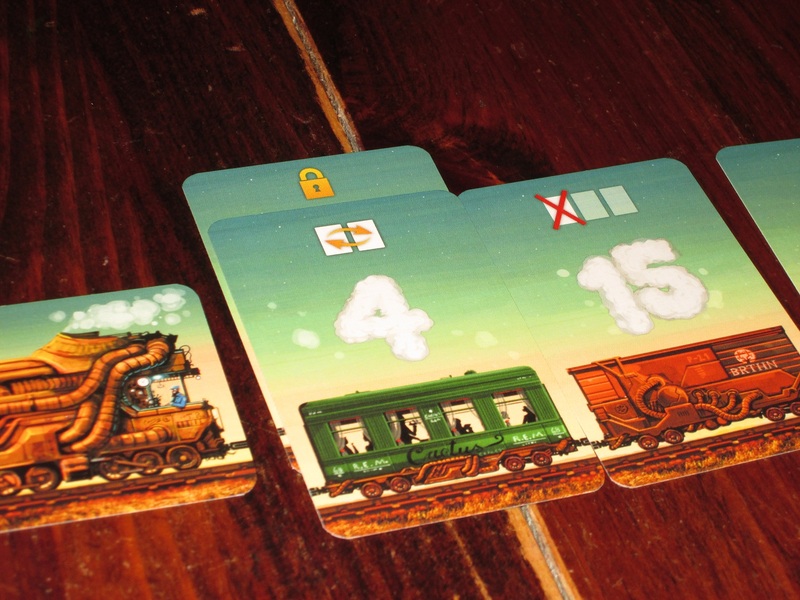 Game of Trains is a light card game for two to four players. 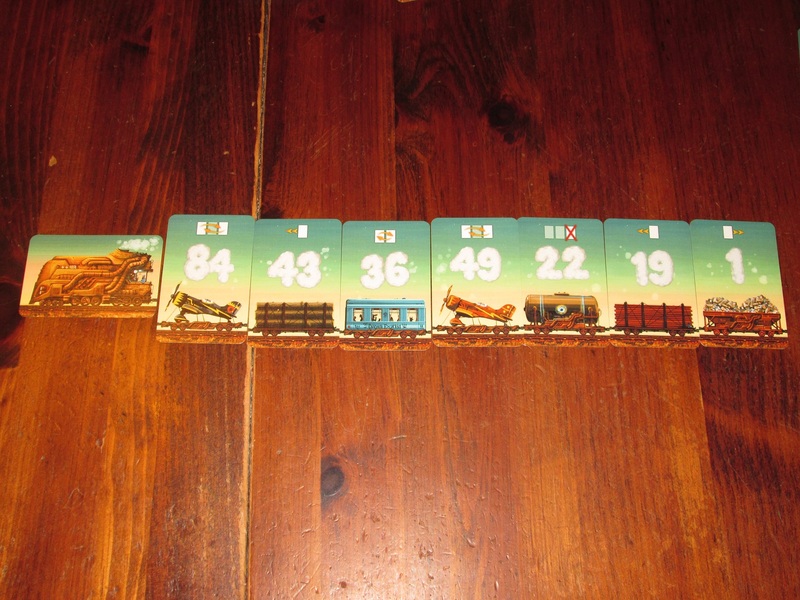 Players have seven railcars that begin in descending order. 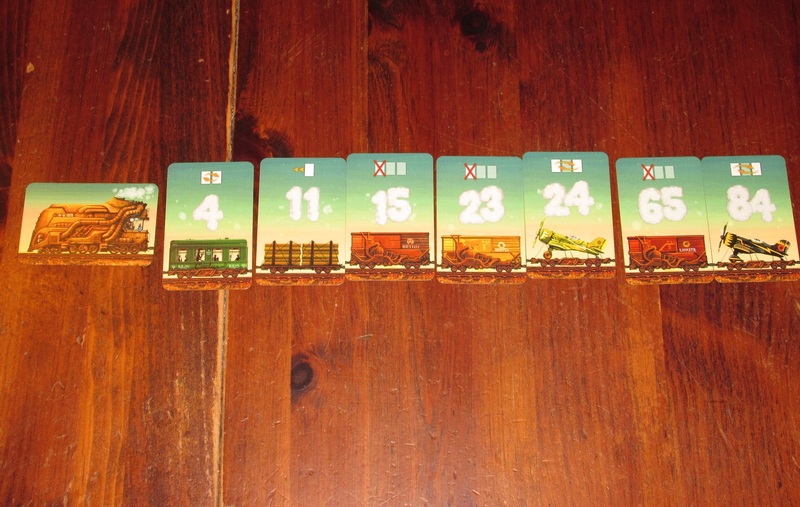 The first player to get their railcars in ascending order wins. 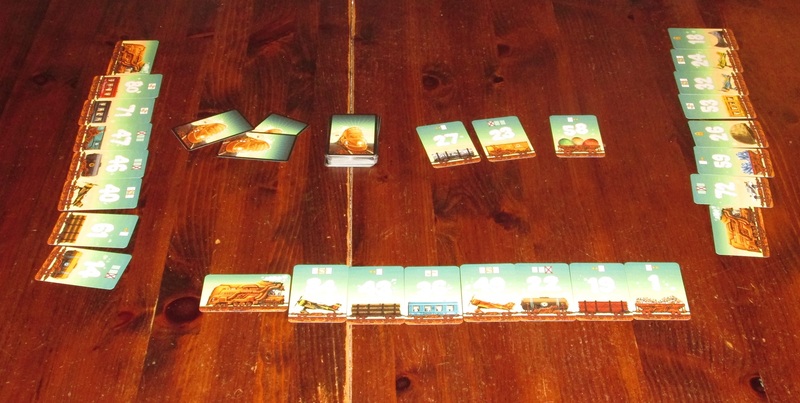 Game of Trains set up for three players. To begin, the deck is shuffled. Each player receives a locomotive card and is dealt seven cards, numbered 1-84, arranging these cards in descending order next to their locomotive. The first player draws one card, and each other player draws one more card than the last person clockwise. Then each player replaces one card in their line with a drawn card and places the replaced card face-up next to the deck (excess cards are discarded face-down). The game begins. Draw a card, replacing a car in the lineup with the drawn card and placing the replaced card face-up by the deck. Take the action associated with one face-up card by the draw deck and then discard the card. Actions include things like swapping cards in the lineup, moving cards in the lineup, forcing every player to discard a specific card in their lineup, or protecting a card from discard. If ever two face-up cards with the same action appear next to the deck, those cards are discarded. 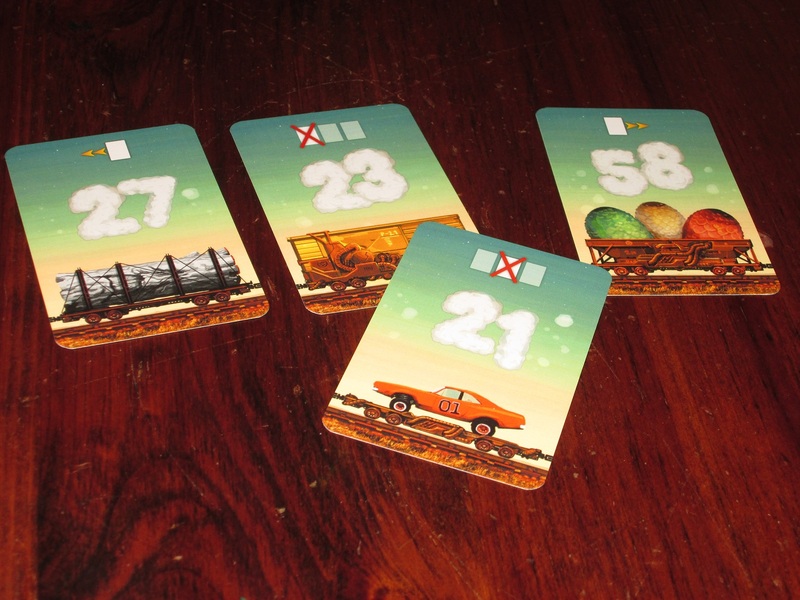 The game ends immediately when one player’s railcars are in ascending order. That player wins. It’s hard to escape comparisons to Rack-O here. Rack-O similarly has players trying to arrange their cards in order by drawing cards and replacing them. But there’s more here than just a Rack-O clone with new art. While Game of Trains is unlikely to set the world on fire, it’s a fast and fun game that looks good and still offers some satisfying decisions. Oh dear. How am I going to get this train in order? What I like about Game of Trains is each turn it presents players with a simple decision–draw or take an action–and each option has its negative consequences. The actions allow players to rearrange the cars in their lines, but only in specific ways. So you can take an action, but it often takes several actions to get the railcars just the way you want them. But drawing a card involves the unknown. Regardless of what you draw, you have to replace a card in your line, even if the card you drew is worse. Players have to examine their cards carefully and hedge their bets about what options might be available to them in the future and what cards they might draw. I like this tension over Rack-O. 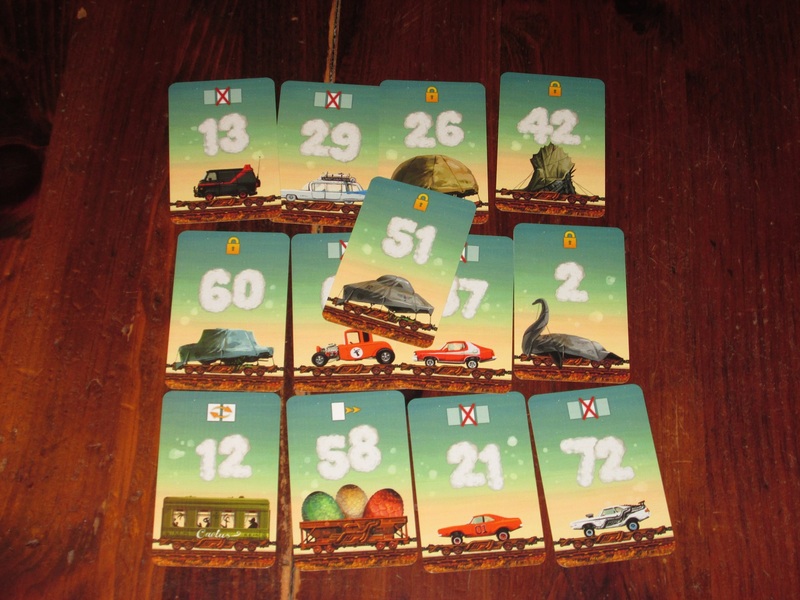 Whereas in Rack-O replaced cards become a discard pile that other players can draw from, in Game of Trains, replaced cards become actions that the other players can take. And this adds another wrinkle to the game, because players will have to replace cards in their lines carefully in order to avoid making certain actions available to the other players. Sometimes this might involve playing suboptimally just to keep another player from getting that swap card they desperately need. You can also try to control the action pool by replacing a card with an action matching what’s in the pool, which discards them both. I like this interaction and added wrinkle. Every card has a number and a special action. Only the number matters if it’s in your train; only the action matters if it’s not. And I do think the special powers add something to the game. Even though there are several potential actions available in the deck, they are all simple to understand. And having to manipulate your train cars in specific ways forces players to think a few moves ahead as they consider how they might be able to get everything in line. 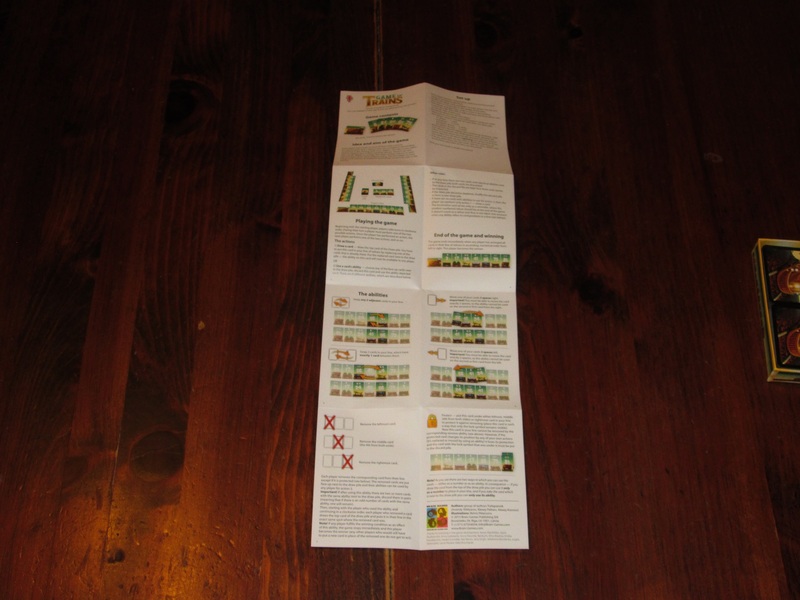 The rules sheet for Game of Trains (the reverse is the rules in another language). This game is simple to teach, play, and understand. No, this isn’t a brain burner by any means. This isn’t even, say, Coloretto. It’s a simple, casual card game that plays fast. It has some decisions to it, but there’s also a significant amount of luck that may frustrate players who value Strategy with a capital S. But sometimes a light game that doesn’t take itself too seriously is just what you want, and this fits the bill nicely. I think this game will go over especially well with family audiences. My kids are too young for Game of Trains, but it’s conceivable that they’ll be ready for it within a few years. There are just a few rules, which can be taught to adults in two minutes or less, and the flow of the game is very casual. While decisions do matter, as I mentioned, there is also some luck in the game, which more or less evens the field. 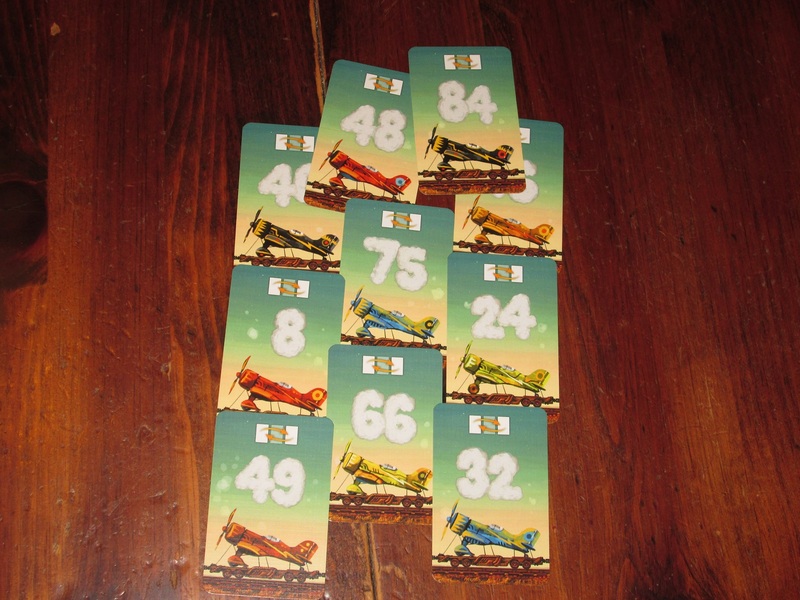 There are several airplane cards, but each is illustrated differently. The production here is nice. I love the whimsical train artwork, and while several pieces are repeated, no card is identical. (For example, there are lots of railcars carrying airplanes, but each plane is painted differently.) There are also lots of Easter eggs in the railcar illustrations, which are fun to look at and find. The cards are of excellent quality with linen finish. I also like that the game fits in a tiny box, which seems like the right amount of shelf space to devote to a game of this type. I’ve played several games now with two and three players, and I think the game works fine at both counts (and likely up to four–the game moves swiftly and isn’t hurt by the addition of players), although I prefer the two-player game because it’s easier to track what my actions will leave open to other players. There are lots of Easter eggs in Game of Trains like UFOs, aliens, and Nessie. Is this train headed to Area 51? I enjoy Game of Trains quite a bit, but I also have enjoyed Rack-O before it. It’s not the kind of game I’m always in the mood for–I prefer games with a little more meat on their bones–and I won’t often suggest it with my regular gaming groups, but it’s one I’m always willing to play because there are meaningful decisions in the game, the art is pleasant to look at, and I find the puzzle in the game a fun one to solve, especially since the whole game, start to finish, doesn’t take very long to play and doesn’t involve much rules-learning investment from the players. It’s one I intend to keep in my bag for family gatherings, when conversation is more important than concentration. 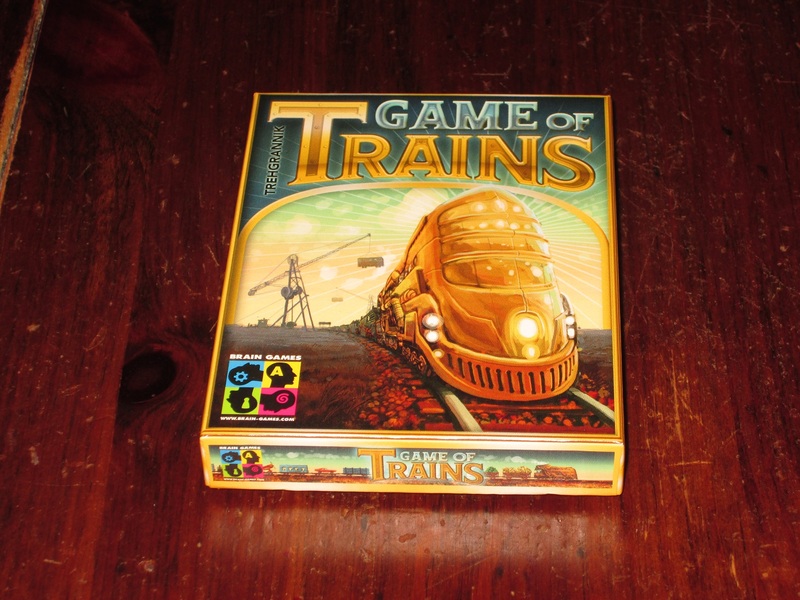 iSlaytheDragon would like to thank Brain Games for providing us with a copy of Game of Trains for review.